I remember when I first started getting interested in politics. I was a junior in high school, and Barack Obama and John McCain were running for president. For the first time ever, I actually felt invested in the idea that someone might become president and change things for the better. Then I waited a few years and realized that nothing changes. 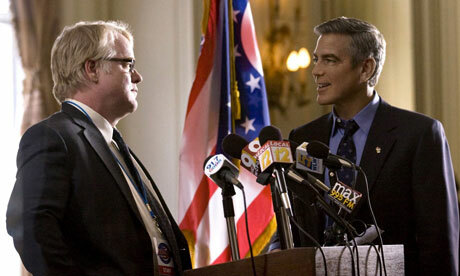 “The Ides of March,” the fourth film directed by George Clooney, is the perfect film for all of us cynics out there. Some might be turned off by the film’s dark tone, but it is the touch of realism that Hollywood fairy tales about politics so desperately needed. At the beginning, the optimist will feel like Stephen Meyers (Ryan Gosling), the young and ambitious junior campaign manager for presidential candidate Mike Morris (Clooney). Meyers is highly admired and sought after for his skills. It may be less because it is talented and more because he is clueless. Morris, an obvious allusion to our current president, runs on a campaign of hope and change. His speaking ability and intelligence seem too good to be true. No candidate is good without a loyal team behind them. Things are going well for the Morris campaign as they make their way through the Ohio primary. Morris looks like the candidate to beat, and Meyers get more and more acclaim from his peers. But after Stephen is approached by the rival candidate’s campaign manager (Paul Giamatti) things go down hill. This, topped with the discovery of a shocking scandal, throws the whole campaign into chaos. “The Ides of March” made me think back to a quote from one of cinema’s shadiest politicians, Harvey Dent, in which he claims, “you either die a hero or live long enough to see yourself become the villain.” The dehumanizing process of politics has been touched upon in movies time and time again, but in “The Ides of March,” there is no white knight, only a bunch that are stuck in the gray areas of life. As a viewer, you grow to like every character, and then you grow to hate them. By the end, none of them even look like good guys or bad guys anymore. This is a tale of the most twisted morality possible. While Morris is the film’s central character, his physical presence is sparse throughout. He is like this film’s Gatsby, as our view on him is shaped more by the perceptions of others than by his actual presence. And when we do see him, Clooney plays him more as a blank slate who can easily be swayed in either direction. His views are called idealistic for a reason. By the time a campaign ends and an election starts, a candidate is no longer a reflection of their views but rather of everything they need to win. Despite the importance of the candidate, Gosling ends up stealing the show as the naive Stephen Meyers. Gosling has been getting better by the movie, and this role should earn him his second Oscar nomination. He has developed a talent for playing characters with a kind and almost innocent outer shell, but with very dangerous tendencies. Here, the danger he holds is in in the naivety of his actions, including his fling with an intern (Evan Rachel Wood). By the end, when he his own voice has been reduced by the endless political commentary running through his headphones, he has officially become a victim of politics. That final expression is stoic yet screaming in inescapable pain. Watching “The Ides of March,” I was reminded of the recent, equally pessimistic films such as “Michael Clayton” and “The Ghost Writer.” Something that “The Ides of March” has is the ability to make the trivial thrilling. A scene in which Morris’s senior campaign manager (Phillip Seymour Hoffman) steps into a car is so thrilling even though the camera remains stationary. We know something bad is going to happen, but we are denied seeing what exactly it will be. Clooney can make a situation go on for longer than it should, and make us want to keep watching it. Much of the movie is like a ticking time bomb that takes its time to go off, just to mess with its victims. Clooney shows improvement as a director and unlike many actor-directors, he is not just directing for good performances and writing, but rather for the movie as a whole. He really cares about the consequences of where a camera is placed. The lighting emphasizes shadows. One of the most memorable shots in the movie is of Gosling, in silhouette, standing in front of a giant American flag. Behind this flag, a symbol of freedom, what keeps this country free and democratic is a shadowy, corrupt underworld of lies and false intentions. In trying to make the small things meaningful, the writing turns dull, political jargon into a fast-paced function of the thriller itself. In “The Ides of March,” ideas and meetings are more action-packed than shootouts and car chases. Republicans may swoon over the movie’s treatment of the Democratic Party, while Democrats will balk. But the great part about this movie is that it is an allegory not on political beliefs but rather on political corruption. At face value, this is a movie about the disappointments of Barack Obama. Deeper down, Morris is a politician who is more like John Edwards; on the outside, he is a friend of the people but truthfully, he is just fending for himself. The movie takes its title from the day in which Julius Caesar, who’s power was increasing, was assassinated at the heads of the members of the Roman Senate. This accurately describe the heated relationship between Morris and Meyers, as well as the morally hazy intentions of every character in the movie. Nowadays, few people ask the right questions about our political system. “The Ides of March” is provocative enough to do just that. This entry was posted in Barack Obama, Evan Rachel Wood, George Clooney, Movie Review, Paul Giamatti, Phillip Seymour Hoffman, Politics, Ryan Gosling, The Ides of March on October 23, 2011 by ian0592.